Persistence Market Research (PMR) analyzes the Asia Pacific, North America and Europe Fluorinated Solvents market in its new publication titled “Asia Pacific, North America and Europe Fluorinated Solvents Market: Global Industry Analysis 2013 – 2017 and Opportunity Assessment; 2018 – 2026”. This study provides market intelligence on the Asia Pacific, North America and Europe Fluorinated Solvents market for the forecast period 2018 – 2026. The main objective of the report is to identify various market dynamics and provide recent updates and insights pertaining to the segments of the Asia Pacific, North America and Europe Fluorinated Solvents market. To provide a better understanding of the market, the report also offers analysis of drivers, restraints and trends that will have a significant impact on the growth of the Asia Pacific, North America and Europe Fluorinated Solvents market over the forecast period. To understand and assess the market opportunities and trends, the Asia Pacific, North America and Europe Fluorinated Solvents market report is categorically split into different sections based on product type, application and regions. The report starts with the market overview, market definition and market taxonomy and also covers value chain, drivers, trends and restraints. The report offers valuable insights on the impact of these segments on the overall market growth. To offer accurate insights, each section discusses the qualitative and quantitative aspects of the Asia Pacific, North America and Europe Fluorinated Solvents market. The report also provides market value (US$ Mn) data, absolute $ opportunity and total incremental opportunity for each segment to brief the reader about the revenue opportunities from the application and region/country-wise segments over the forecast period. In the final section of the report, the report offers detailed insights on the competition landscape with company market share and performance to offer a dashboard view of key players operating in the Asia Pacific, North America and Europe Fluorinated Solvents market. These insights would enable clients to assess strategies deployed by market leaders and help them make informed decisions. The report also provides the information about the Fluorinated Solvents product launches, channel and application Strategies which will help manufacturers planning to enter into the business of Fluorinated Solvents. The report also provides information on production selection criteria of Fluorinated Solvents as well as key companies channel, sales and production plant location of Fluorinated Solvents. For market data analysis, we have considered 2017 as the base year, with the market numbers estimated for 2018 and forecasts offered for 2018–2026. The report considers the market size of the Asia Pacific, North America and Europe Fluorinated Solvents market at a regional level and splits & evaluates the market at a country level. The forecast assesses the total revenue (US$ Mn) of the Asia Pacific, North America and Europe Fluorinated Solvents market. In order to provide an accurate forecast, we have started by sizing up the current market to offer crucial insights on the overall growth prospects of the Asia Pacific, North America and Europe Fluorinated Solvents market over the coming years. The crucial market data including the base number and segment splits has been devised through an in-depth secondary research. This data is then triangulated on the basis of different verticals, considering both supply side and demand side drivers along with the other market dynamics identified in the regional Asia Pacific, North America and Europe Fluorinated Solvents market. Valuable insights offered in the report have been analyzed through primary interviews with Asia Pacific, North America and Europe Fluorinated Solvents manufacturers, distributors & suppliers, formulators and industry experts operating in the Asia Pacific, North America and Europe Fluorinated Solvents market. Crucial insights offered in the report evaluate the actual market size (US$ Mn) in 2017 with regard to Asia Pacific, North America and Europe Fluorinated Solvents market and the expected Asia Pacific, North America and Europe Fluorinated Solvents market value over the forecast period. We have also analyzed various segments of the Asia Pacific, North America and Europe Fluorinated Solvents market in terms of basis point share (BPS) to understand individual segments’ relative contribution to Asia Pacific, North America and Europe Fluorinated Solvents market growth. In-depth insights compiled in the report will allow the readers and clients to identify various key trends governing the Asia Pacific, North America and Europe Fluorinated Solvents market. The report also analyses the Asia Pacific, North America and Europe Fluorinated Solvents market based on the absolute dollar opportunity. This is usually overlooked while estimating the market forecast. However, from a business development perspective, it is essential to identify absolute dollar opportunity and potential resources in the Asia Pacific, North America and Europe Fluorinated Solvents market. Moreover, PMR has developed an Asia Pacific, North America and Europe Fluorinated Solvents attractiveness index to understand the key segments in terms of their performance and growth in the Asia Pacific, North America and Europe Fluorinated Solvents market. This market attractiveness index would help clients to identify real market opportunities in the Asia Pacific, North America and Europe Fluorinated Solvents market. The Asia Pacific, North America and Europe Fluorinated Solvents Market is estimated to have been dominated by the electronic cleaning application in 2017. The Asia Pacific Fluorinated Solvents market is expected to register a CAGR of 9.0% over the forecast period (2018–2026). Fluorinated solvents are used in various end-use industries, such as medical, electronics, metal aviation and aerospace, for cleaning purposes. They are also used in degreasing as carrier solvents and in the refluxing of printing wiring assemblies. The price of fluorinated solvents is relatively high as compared to that of chlorinated, brominated, light petroleum distillates, glycol & glycol ether and formulated hydrocarbon solvents. In 2014 and 2015, Solvay announced an increase of 20% and 15%, respectively, in the price of Forane (Brand name of Fluorinated solvent offered by company). Thus, the high price of Fluorinated solvents and the continuous increase in the prices of these solvents are expected to hamper the growth of the Western Europe Fluorinated solvents market during the forecast period. Major players identified in the Western Europe Fluorinated Solvents market are focusing on increasing their production capacities and increasing market penetration through increased partnerships with major distributors & suppliers. Thus, due to the aforementioned factors, the Western Europe Fluorinated Solvents Market is expected to gain momentum at a rapid rate during the forecast period. From product type perspective, the HFE segment in North America Fluorinated Solvents market is projected to witness the fastest growth over the forecast period. The HFE Segment is estimated to account for a revenue share of more than 45% in North America Fluorinated Solvents Market by 2026 end. However, the Fluorinated Solvents market in North America is expected to register a CAGR of 10.8%, in terms of volume, over the forecast period. The Fluorinated Solvents market in North America is expected to reach US$ 404.1 Mn by the end of 2026 while recording a CAGR of 13.2% over the forecast period. 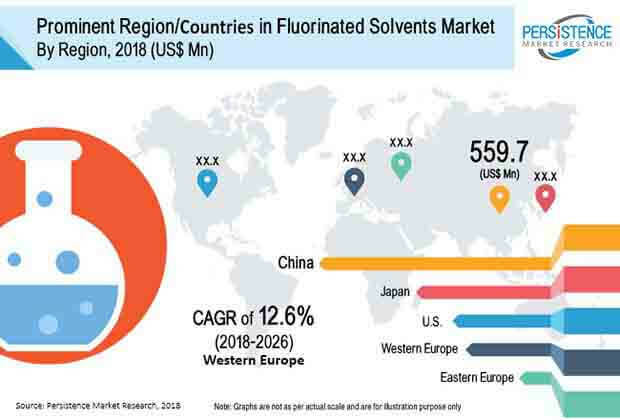 Fluorinated Solvents market’s growth rate in APAC is expected to remain relatively lower as compared to the North America and Europe Fluorinated Solvents Market’s average between 2018 and 2026.